Police charge Julie A. Corey, a friend of Haynes, with being a fugitive from justice. (CNN) -- A judge set bond at $2 million Thursday for a 35-year-old woman who faces charges in the case of a woman whose baby was ripped from her womb. 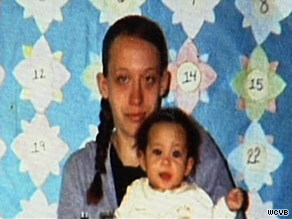 Darlene Haynes, pictured with one of her other children, was found slain in her apartment closet, authorities said. Investigators detained Julie A. Corey on Wednesday afternoon and charged her with being a fugitive from justice. They found her with a newborn in Plymouth, New Hampshire, during an investigation into the death of 23-year-old Darlene Haynes, whose body was found Monday in the closet of her home in Worcester, Massachusetts. Haynes was eight months pregnant. A friend told CNN affiliate WHDH that she received a text message from Haynes at 11:20 p.m. July 23 that said she was having wine coolers with a friend at her apartment. Officers received tips from women who became suspicious of another friend of Haynes' who turned up with a newborn girl when Haynes disappeared. Worcester police said they learned that "a woman connected with Ms. Haynes" told her acquaintances she had delivered a baby sometime during the night of July 23 or morning of July 24 at an undisclosed Massachusetts hospital. "When the woman appeared with the newborn baby girl in Worcester on Friday, July 24, the suspicions of a number of this woman's acquaintances were piqued. In the aftermath of the discovery of Ms. Haynes' body and the information that her fetus was missing was reported in the media, several of these acquaintances advised detectives of their suspicions," the police statement said. Police sought and found Corey and determined she and a man had moved to New Hampshire, the statement said. The two were brought in for questioning and Corey was arrested on suspicion of being a fugitive from justice. "This charge is supported by probable cause developed by the Worcester Police Department alleging the kidnapping of the infant child found in the custody of Julie Corey," the Worcester police statement said. The baby was determined to be a few days old, said Michele Hutchins, spokeswoman for Speare Memorial Hospital in Plymouth. "She is in good condition and doing just fine," Hutchins said. Hospital officials are expecting to transfer her custody to Massachusetts child welfare workers. "As the story began to unfold more over the last 24 hours, and then of course with the arrest of someone here in Plymouth tied to that, and then subsequently a baby coming into our hospital, a lot of people are certainly touched and hoping for the best," Hutchins said. During an arraignment Thursday, Corey did not waive extradition to Massachusetts. She is scheduled to appear in court again on August 31. CNN Radio's Steve Kastenbaum contributed to this report.